This post is to update and discuss all the action from todays poster reveal, updates as they happen. A bookmark with the URL on it was given out at the bookstore. CerberusVenting so overall it was azskye i and one other. all they handed out were bookmarks. No updates from anyone yet. hi mandy. a lurker no longer. i'm off spoilertv sight for now. so if you are looking let us know what you find that's not spoilery but about today's reveal. any tweeters in that bunch? Yes CerberusVenting does post to both sites. I think he will mainly update via Twitter once he arrives at the bookstore. Would a call to the bookstore be warranted? c'mon cerberus, where are ya? some color commentary please. maybe nothing to report yet. 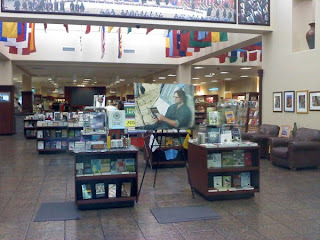 CV just posted a twitpic of the bookstore. there he is! good man, cerberus. that looks so cool! I gotta tell you, there's one poster I don't need. Yeah it's not for me either. The "4" is darker than the other numbers. I'm surprised that with a topic like "the love triangle" that that is what they came up with. I could think of several other possibilities that I would've liked better. Good catch on the dark red 4. Thanks CV for getting us the link! It's a nice concept, but I wish that it was drawn better. JMO. Someone on DarkUFO suggested Jackson Pollock for Dr. Artz's Mishap. Thought that would be great. Yeah, it's a slightly different style, but I like it. I already own two other prints by the artist and I'm buying this one. FYI - Leia Bell is kind of a big deal in the screen printing world. She also owns and operates the store Signed & Numbered in Salt Lake City. Great store. Not my cup of tea I'm afraid. I think this one will be a slow seller. Leia Bell likes polar bears too. Do you think the numbers will mean anything? Or is it just coincidence? We have a 5 that stands out on the Dharma Van and now a 4 that stands out on The Love Triangle. Sayid'sgirl, perhaps we need one number or letter from each poster ? 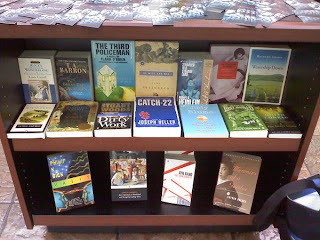 CV has posted some more pictures from the bookstore. LOVE the Oceanic magazine and the glasses! Melissa Lossa will love the picture of all the books. In-flight magazine. What's up with all the grammar/typos? LotteryTicket - don't notice any typos on this one. which are you referring to? There's no doubt that they gave her this image suggestion. Writing over entrance feed #4. May need to look at episode version to make comparison. CV tweeted that they did get the bookmarks. DoZa - Yeah, I know, and I'm pretty excited. Based on hints about "top secret posters" I think we'll be seeing some from Dan McCarthy and Jay Ryan who are both fantastic. I can't wait. Seriously, this whole DCPB thing is right up my alley since I love both screenprinting and Lost. well, I'm out. darn. have to unplug for the rest of the day. waffle, I love this concept also, but can you please tell me where you would post this poster? Nothing says 'art' like Sawyer lifting Kate's blouse. So far i've got the quotes the URLs come from but I can't place who said, I think that man was you, or when? Anyone else know, it's driving me mad? glad to see the print is getting more love over here than on darkufo.. i love it, but then again, i've been collecting her prints since 2001 when she did all the show posters @ kilby court in slc..
@ waffle: are you from salt lake too? i post as lostinslc on darkufo.. I think I'm with most of you on passing up this poster. Strange concept! Thanks to Cerebus for being there. As someone at DarkUFO said, "Horrible." 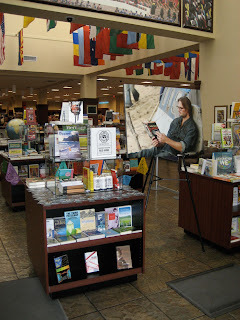 The book store display pictures are pretty cool. Some though went into gathering the books. All the book club books are there...I wouldn't mind one of those bookmarks! I've seen "Horrible", "Hate it", and "Not worth it"
I don't think it is that bad, I just think it won't be to a lot of people's taste. Perhaps everyone that orders this print will get a bookmark ? 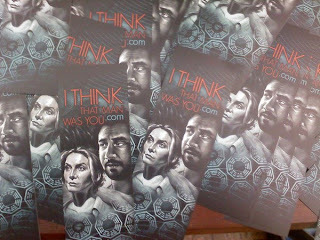 By the way the Hub page is updated with the bookmark image, you can download and print your own ! You can buy now, but I won't. I liked Locke and the Crash best and bought them. I didn't care for Numbers and Dahma Van and skipped them. I put this poster in between the other ones. here's a random question... when did we ever see the book Babar on the show? just noticed it behind the Dharma beer in the close up image on the Hub..
nikkimatt - Sawyer called Hurley Babar in "One of Them"
For those who are disappointed in the style and wish it was "drawn better", remember this is art. Art can be represented in any way the artist sees fit. The latest print indeed takes on a different style choice from what we've seen so far, but that doesn't mean it's bad, or not worth buying. I hope this isn't the Jack poster I have been waiting for. Seeing how it was one of the worst moments for him on the show, I wouldn't want that as my poster. I totally agree it's a matter of personal taste. All of these are. There are some I like and some I don't, but I'm impressed with the artistic abilities and interpretations. They're all very cool in their own way. I would have a problem hanging this one just because of Sawyer and Kate in the cage...having to explain that one to my kids and/or people who walked in my front door! haha I think it's interesting that they picked this to represent the love triangle. Esp. since you don't even see Jack's face. But this is all just my opinion, I think the style is pretty cool. @Boo - Eric Tan's "The Crash" is most certainly "Jack's poster". Where's the Eko love? Or Ben? I guess for me, the best representation of the love triangle would either be Sawyer jumping out of the helicopter (thus, making the choice for Kate) or Jack and Sawyer beating the crap out of each other in um, was it the first part of The Incident? @Scoutpost - That moment, when Jack sees Kate and Sawyer in the cages, is basically the first major turning point in the love triangle storyline. Seeing this breaks Jack's heart, and in turn leads to some big events. I think the image represents the title "The Love Triangle" very well. Of course, it could have been more obvious, depicting Sawyer, Kate, and Jack more prominently, but what's the fun in that? I agree with you. The art isn't bad at all. It's very good. It's just not my particular taste. Also art sometimes needs time to grow on you. The Crash wasn't one of my favorites when I first seen it. I kind of like it now, but now it's too late to buy it. Which is ok. I'm not going to impulse buy to get something before it sells out hoping it will grow on me. Yeah, agreed. Her art isn't really my style, but I wouldn't be buying anything called "the love triangle" anyway. LotteryTicket - My TV room is reserved for TV/Movie/Music posters/screenprints/etc. Assuming I buy a couple of these, this will fit right in. nikkimatt - No I live in Delaware, but I've spent a lot of time in SLC on business, so I know the town fairly well. S&N was a pleasant find, I always loved going in there to browse. And buy way too many of the presidential prints, but that's besides the point. that bookmark is very cool looking. wonder if it's a tiny part of a bigger print -- perhaps the final dcaapb poster? also -- wonder if there's anything on the back of it. cerberus? I've updted the main post with the pictures from the hub page. Was the memorabilia at the bookstore behind glass? I don't suppose anyone tried to buy/ask for any of the things there, eh? 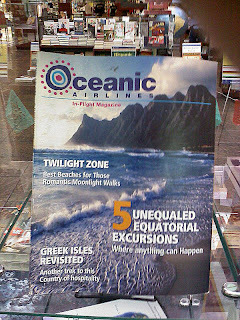 Would be cool to get the Oceanic magazine. Oh yes,,attempt was made concerning the availability of the show's " props" that were in the display. Unfortunately,,as we were to be informed by a underling of ABC Promotions..at about 10 minutes after store opening..the person who could answer such questions,,," couldn't make it to the event.." Apparently the un-attendee hadn't heard of the old show business saying..The Show Must Go On..and that is why he is in the Promotions dept.The U of A Bookstore manager had no idea what was what , except to say,",they showed up last nite and set up the display, that is all i know." Even with a strong hint that a certain Dharma Box Wine prop would be really nice to have..or..a certain set of broke glasses..or..etc etc..no answer was forthcoming except...please take a book mark...Perhaps these fine bookmarks will be redeemable someday for something of increased fan appreciation value..I hear, they are already being traded...I got a bunch of them if any want to trade...especially since the ABC Promotions underling let it out that this " event" was to be the only one in Arizona. Yes, Phoenix,,with your 3/4 of the whole state population and market.,you just got poo poo'ed on..by a Promotions person who doesn't even show up for an event he's to throw. Its just..if you are going to do a Fan Appreciation Event...uuummmm,,show some appreciation,,,and don't make it with concern to Where you are doing it,,but For Whom you are doing it. I understand,, that things come up in life that make plans impossible..but an underling who has no idea on whats going on,,and just walks away leaving us scratching our heads..i guess just shows how distant the Promotions dept is from Show Business..
Mel, I'm digesting your comments. I "feel your pain" regarding dentistry. I hope nothing to serious and that your will recover. Omg something finally happens here and I can't go. I wouldn't even mind just the bookmark. CRAP! Intrepid LOST FANs...That be CV on the left,then Cindy or is it Sandy, my apologies, I have forgotten,,and James from England/Australia on the right. 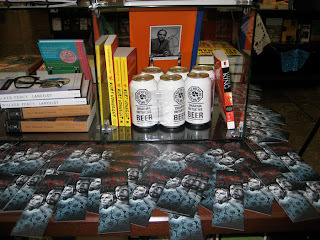 MEL, hope you can get 'back on the wagon' with this after your disappointment at the bookstore. There's still a lot more in store! ABC/Disney and most of the locations they've chosen so far are not prepared to handle mass crowds of wild Lostfans (except for the first one at the club) so just for safety reasons that's why they're trying to keep these events lowkey and 'uneventful'. The DCPB.com site warns as much with their 'Rules of the Road'. They're really trying to discourage many people from showing up expecting something. Too bad they couldn't at least do a little something for the folks who did show at the bookstore though. Maybe the next one will be more fun?